The Rangers dropped a crucial Game 5 at Madison Square Garden on Sunday, forcing them into a situation where htey need to win the next two games in order to advance to the Stanley Cup Finals. Photo courtesy of MSG Photos. Following their most convincing win of the 2015 playoffs, nothing carried over to Game 5 at Madison Square Garden, as they were shutout by Ben Bishop and the Lightning, and falling to a 3-2 series deficit following tonight’s 2-0 loss. 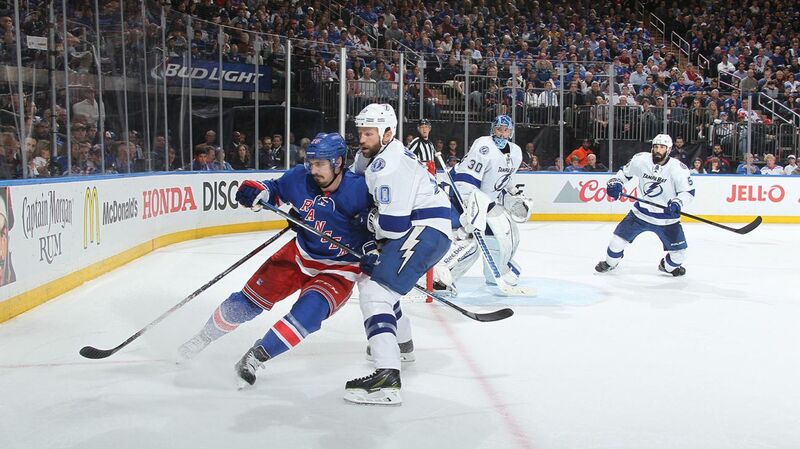 The Rangers must win in Tampa Bay on Tuesday in order to force a Game 7. It’s disappointing that the Rangers laid an egg in one of the most important games of the season, and not taking what they learned in Game 4 into their game plan. They didn’t crash the net at all or get to the middle of the ice for prime scoring chances and rebounds, which is one of the ways they scored goals on Friday. The power play was anemic tonight, and two good plays from Tampa cost the Rangers. New York had tons of puck possession and zone time, but it didn’t lead to shots on goal, The Rangers were trying to pass their way into the net, and the Lightning were having none of it. Instead of driving to the net, they stayed around the perimeter. It was ultimately a 60 minute skating session, with the Rangers not doing enough to get pucks past Bishop. 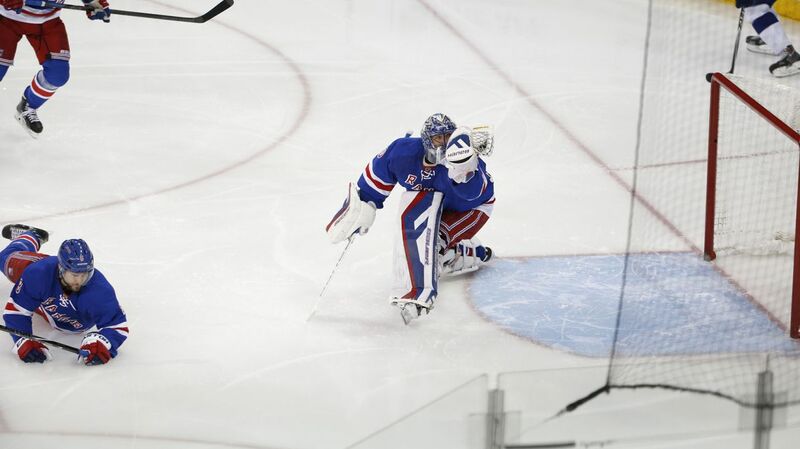 Henrik Lundqvist was solid, stopping 20 of the 22 shots he faced. He didn’t have much of a shot on either goal, especially Stamkos’ power play score. In elimination games, which will be Game 6 in Tampa, Lundqvist has been very, very good lately. Now the rest of the team needs to pick him up. Henrik wasn’t tested often, but he was very solid, making some big saves, including this glove save on Steven Stamkos in the second period. Photo courtesy of MSG Photos. At even strength and on the power play, the Rangers were sloppy with their execution, couldn’t continually create scoring chances, and did not manage the puck well. On top of that, the Lightning played a tremendous game defensively. They were extremely strong on the penalty kill, smothered the Rangers’ puck carriers, blocked a lot of shots, and allowed maybe three high quality chances in this game. The Rangers were pushed to the perimeters, and never penetrated the middle of the ice. JT Miller was one of the lone bright spots for the Rangers in this game, creating scoring chances for his linemates, using his size and strength well, and coming close to scoring a few times. He does not have a goal in the playoffs, but it feels like he will catch a break soon. Rick Nash also played well with Miller on the top line, finishing with 5 shots on goal. For most of this series, the Rangers’ power play has been a deadly weapon and a way for the team to swing momentum back in their favor. Tonight, it was the exact opposite. They had four opportunities early, and didn’t really get much of an advantage off of them. Tampa’s penalty kill was excellent, and the Rangers didn’t have many shots or chances. That zapped the momentum out of the Rangers, and the Lightning went on to score two quick goals after their penalty kills. The Rangers largely controlled the first half of the game. They had more possession, were winning puck battles and limited the Lightning to just eight shots on goal. But the four failed power play attempts, two in each of the first two periods, started to give the Lightning some confidence. Valtteri Filppula opened the scoring in the second period with just 6:31 left to be played. Anton Stralman made a great pass off the boards to Steven Stamkos, and he dropped it off to Filppula for a rocket of a wrist shot that beat Lundqvist stick side. Later in the period, Marc Staal was sent to the box for tripping, and Tampa Bay took advantage of their power play. Nikita Kucherov faked a shot and passed it to Ondrej Palat, who quickly sent it over the royal road to a wide open Steven Stamkos for an easy tap in. Dan Girardi and Kevin Klein went down to the ice, making it easy for the Lightning to complete their tic-tac passing for the goal. Stamkos now has one goal in the last four games of this series. The Rangers had 16 shots after two periods, but didn’t really test Ben Bishop, as both teams had tightened up defensively. Bishop made a good pad save on Martin St. Louis in the first period on an odd man rush, and another one on Rick Nash’s shorthanded shot, also coming on a rush. Henrik Lundqvist made the best save of the night in the second period, robbing Steven Stamkos in the low slot with the glove. 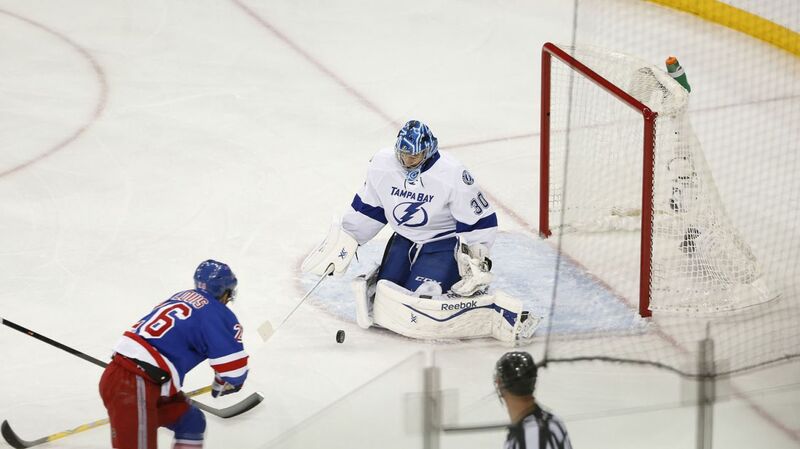 Martin St. Louis tried to go five-hole on Ben Bishop, but he closed the pads to make a big stop. Photo courtesy of MSG Photos. The third period was much of the same. The Rangers had more possession, but all the time in the Lightning zone didn’t really lead to anything. Bishop made a few saves late, and Tampa Bay moved to within one win of advancing to the Stanley Cup Final. The Rangers need to regroup and figure out what has helped them win against the Lightning, and just get back to the basics. They play well when their backs are against the wall, and if they want to return to the Stanley Cup Final, they’ll need to play much better than they did tonight. Get ready for an emotional, gut wrenching, must win Game 6 Rangerstown. Posted on May 25, 2015, in Game Recaps and tagged Alain Vigneault, Ben Bishop, Cam Talbot, Carl Hagelin, Chris Kreider, Dan Boyle, Dan Girardi, Derek Stepan, Derick Brassard, Dominic Moore, Hartford Wolf Pack, Henrik Lundqvist, James Sheppard, Jesper Fast, JT Miller, Keith Yandle, Kevin Hayes, Kevin Klein, King Henrik, Madison Square Garden, Marc Staal, Martin St. Louis, Mats Zuccarello, Matt Hunwick, MSG, MSL, New York Rangers, NHL, NHL 2014-2015 Season, NHL Playoffs, NY Rangers, NYR, Rangers, Rangers Nation, Rangerstown, Rick Nash, Ryan Bourque, Ryan McDonagh, Stanley Cup Playoffs, Steven Stamkos, Tampa Bay Lightning, Tanner Glass, The Ranger Zone, Tyler Johnson. Bookmark the permalink. Leave a comment.